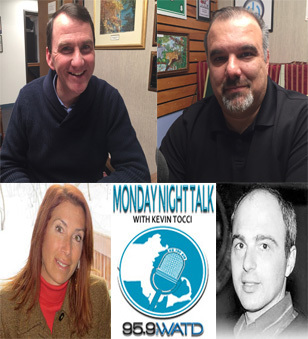 Check out the latest Monday Night Talk podcast as host Kevin Tocci speaks with State Representative Matt Muratore & Donna Rodriguez, Director of Marketing and Outreach for PACTV about the Plymouth Rotary Auction; Congressman Stephen Lynch; Massasoit Theatre Company Director Steve Dooner & Laura Zerra, from Discovery Channel's Naked & Afraid!!! Do you have a topic for a future show or info on an upcoming community event? 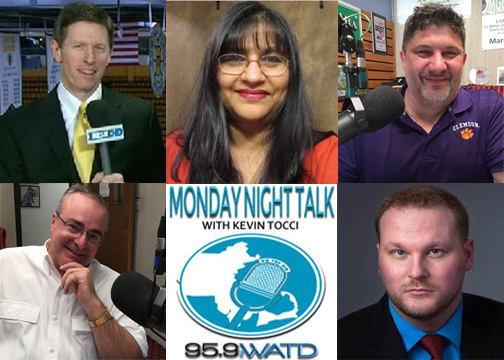 Email us at mondaynighttalk@gmail.com or "like" and post a comment on our Facebook page: Monday Night Talk on 959FM WATD. If you're a fan of the show and enjoy our segments, you can either download your favorite segment from this site or subscribe to our podcasts through iTunes today! © Monday Night Talk with Kevin Tocci - 2019. Unauthorized use and/or duplication of this material without express and written permission from the show host and/or owner is strictly prohibited. 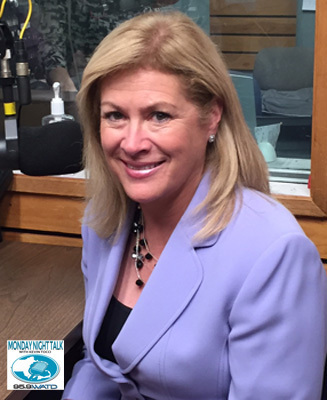 Here's the August 13, 2018 Monday Night Talk show which was used for a political forum featuring Republican candidates running in the US Senate race; State Rep. Geoff Diehl, John Kingston and Beth Lindstrom. The forum, which was only attended by Lindstrom, was moderated by WATD managing news editor Christine James, with question being put to the candidates by Kevin Tocci and Charles Mathewson. Do you have an topic for a future show or info on an upcoming community event? Email us at mondaynighttalk@gmail.com or "like" and post a comment on our Facebook page: www.facebook.com/mondaynighttalkon959fmwatd. If you're a fan of the show and enjoy our segments, you can either download your favorite segment from this site or subscribe to our podcasts through iTunes today! © Monday Night Talk with Kevin Tocci - 2018. Unauthorized use and/or duplication of this material without express and written permission from the show host and/or owner is strictly prohibited. 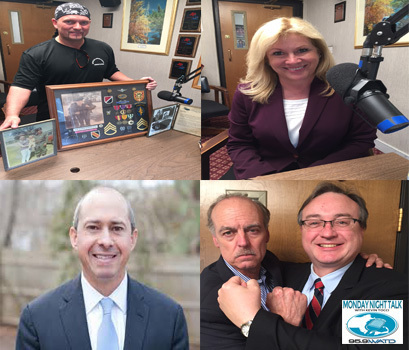 Here's the newest Monday Night Talk radio show podcast from June 11, 2018 as host Kevin Tocci speaks with Jay Gonzalez, former Secretary of Administration and Finance for Massachusetts Governor Deval Patrick & Democratic Gubernatorial candidate: US Senate Beth Lindstrom; Gold Star Family Member Richard Fitts Jr. discusses his film project, "21 Years - A Folded Flag," plus the latest episode of, "The Gloves Are Off" with Steve Gill and Brian Cook! 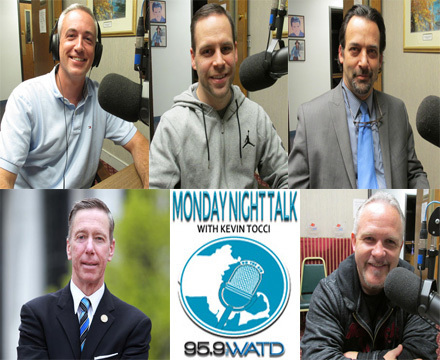 Here's the latest Monday Night Talk radio program with host Kevin Tocci and Matt Nelson that aired on June 12, 2017 featuring State Representative Dave DeCoste; Kerry J Byrne, from the Boston Herald & ColdHardFootballFacts.com; Claudia Fox Tree with the Massachusetts Center for Native American Awareness; Ryan Mauro, National Security Analyst with the Clarion Project and NESN's Jack Edwards, Voice of the Boston Bruins!!! Do you have an topic for a future show or info on an upcoming community event? Email us at mondaynighttalk@gmail.com or "like" and post a comment on our Facebook page: www.facebook.com/mondaynighttalkon959fmwatd. If you're a fan of the show and enjoy our segments, you can either download your favorite segment from this site or subscribe to our podcasts through iTunes today! © Monday Night Talk with Kevin Tocci - 2017. Unauthorized use and/or duplication of this material without express and written permission from the show host and/or owner is strictly prohibited. 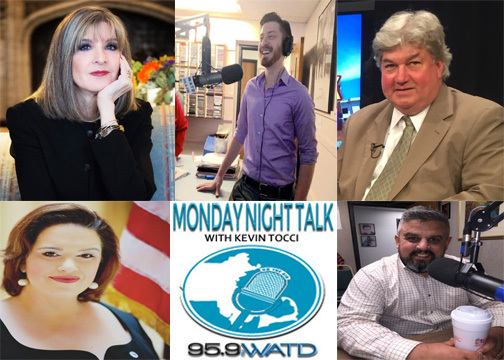 Check out the Monday Night Talk radio program with host Kevin Tocci and Mark Rocheteau that aired on May 22, 2017 featuring State Senator Mike Brady; WMAL newsman Steve Burns; GOP State Representative candidate Craig Pina; Keri Rodrigues Lorenzo, Executive Director of Mass Parent Action and At-Large member of the Massachusetts Democratic State Committee and bestselling author of nine mystery novels and award-winning investigative reporter at Boston's WHDH-TV, Hank Phillippi Ryan!!! 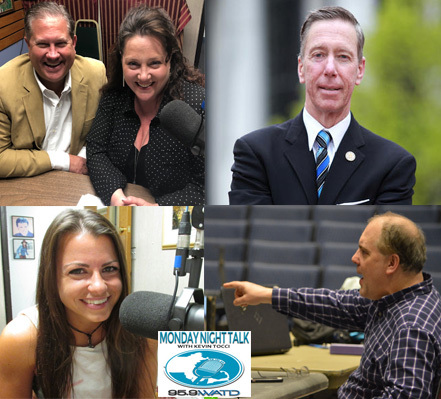 Here's the Monday Night Talk radio show that aired on January 2, 2017 featuring State Representative Jim Cantwell; Gatehouse Media Columnist Dave Wheeler; Dr. Kate Roberts; Matthew "Political Panic" Demar and Automotive Expert Junior Damato! Do you have an topic for a future show or info on an upcoming community event? Email us at mondaynighttalk@gmail.com or "like" and post a comment on our Facebook page: www.facebook.com/mondaynighttalkon959fmwatd. If you're a fan of the show and enjoy our segments, you can either download your favorite segment from this site or subscribe to our podcasts through iTunes today! © Monday Night Talk with Kevin Tocci - 2016. Unauthorized use and/or duplication of this material without express and written permission from the show host and/or owner is strictly prohibited. Here's the Monday Night Talk radio show that aired on December 19, 2016. The guests that appeared on this program include State Representative Josh Cutler and Mike Cogburn with Pembroke Titans Against Drugs; Congressman Stephen Lynch; Attorney Adam Bond, author Casey Sherman and George Earle from Marshfield Community Christmas! Monday Night Talk hosts a political forum for the Massachusetts 9th Congressional District race. 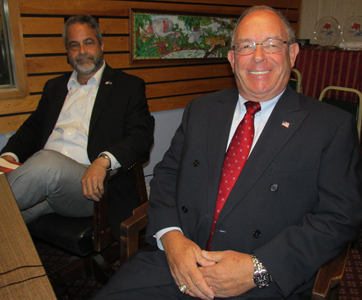 Republican candidates Mark Alliegro and Tom O'Malley participated in the 45-minuteforum. The event was moderated by WATD’s managing news editor Christine James, who also poses questions with Monday Night Talk host Kevin Tocci and WATD reporter Charles Mathewson. Do you have a topic for a future show or info on an upcoming community event? Email us at mondaynighttalk@gmail.com or "like" and post a comment on our Facebook page: www.facebook.com/mondaynighttalkon959fmwatd. If you're a fan of the show and enjoy our segments, you can either download your favorite segment from this site or subscribe to our podcasts through iTunes today! © Monday Night Talk with Kevin Tocci - 2016. Unauthorized use and/or duplication of this material without express and written permission from the show host and/or owner is strictly prohibited. 9th Massachusetts Congressional District candidates from left to right: Mark Alliegro and Tom O'Malley. 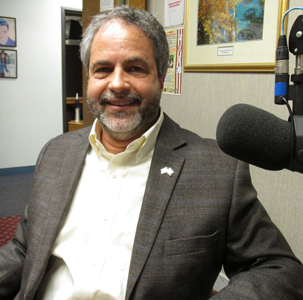 Congressional candidate Mark Alliegro is guest on this segment of Monday Night Talk! Mark, who is a Republican candidate for the 9th Massachusetts Congressional District comes in to talk about his campaign and discuss some of the issue that are involved with the race. To find out more about Mark's campaign, visit his website; www.markalliegroforcongress.org. Do you have an topic for a future show or info on an upcoming community event? Email us at mondaynighttalk@gmail.com or "like" and post a comment on our Facebook page: www.facebook.com/mondaynighttalkon959fmwatd. If you're a fan of the show and enjoy our segments, you can either download your favorite segment from this site or subscribe to our podcasts through iTunes today! © Monday Night Talk with Kevin Tocci - 2016. Unauthorized use and/or duplication of this material without express and written permission from the show host and/or owner is strictly prohibited. Harlan Ullman, known for foreign relations and national security, is a special guest during this segment of Monday Night Talk! Kevin Tocci, Joe Rossi and Richard Rosen chat with Harlan Ullman about the latest terrorists threats and attacks that occurred in Paris. 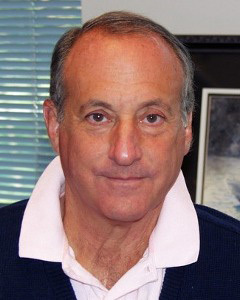 A former naval officer with combat commands in the Vietnam War and later in the Persian Gulf, Ullman (http://harlanullman.net/ ) chairs The Killowen Group that advises leaders of government and business at the highest levels including presidential candidates here and abroad through a brains based approach to strategic thinking. Since the 1980's, he has developed a reputation as a strategic thought leader and thinker in the public and private sectors. He is known for the doctrine of shock and awe and sits on advisory boards for the Supreme Allied Commander Europe and Commander US Forces Europe. Currently a Senior Advisor to the Atlantic Council and Business Executives for National Security, he was a Distinguished Senior Fellow at the National Defense University and professor of military strategy at the National War College. A student and practitioner of global economies, he writes often on the financial crises in UPI and other media and sits on the boards of both private and public companies in the high technology and financial services sectors. His latest book is A Handful of Bullets--How the Murder of Archduke Franz Ferdinand Still Menaces the Peace. Do you have an topic for a future show or info on an upcoming community event? Email us at mondaynighttalk@gmail.com or "like" and post a comment on our Facebook page: www.facebook.com/mondaynighttalkon959fmwatd. If you're a fan of the show and enjoy our segments, you can either download your favorite segment from this site or subscribe to our podcasts through iTunes today!